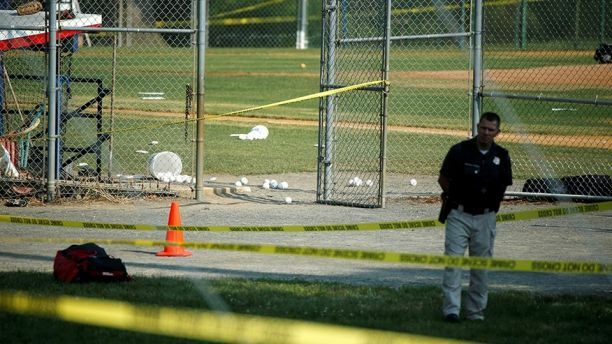 Stephen Dinan and Seth McLaughlin at the Washington Times offer a piece on the police ‘Thin Blue Line’ that stopped the gunman from killing people on the Alexandria, Virginia baseball field. The rifle shots came from the fence over the third base line, shattering the June morning, wounding one congressman and several staffers, and terrifying the two dozen lawmakers and staffers who were also on the field. Then came gunshots from the other side of the field. Three U.S. Capitol Police officers, who were at the field as part of their duty to protect a senior Republican lawmaker, were returning fire. They turned the murderous assault by a left-wing fanatic into a raging gunbattle that kept the man off balance and outside the ballfield fence, giving lawmakers and staffers a chance to run for their lives. The agents then kept the gunman from getting a bead into the concrete dugout where more than a dozen lawmakers and staffers were huddled. “If he’d gotten in the fence, there would have been a bloodbath,” said Rep. Joe Barton, a Texas Republican and manager of the team, which was practicing for the annual Congressional Baseball Game on Thursday. In a day full of very human moments and emotions, the agents who were part of House Majority Whip Steve Scalise’s security detail were hailed as absolute heroes, taking on a man with a rifle while armed only with handguns and averting what those on the field said would have been a certain massacre. “The thin blue line held today,” said Rep. Roger Williams, a coach on the team who injured his ankle diving to the floor of the dugout to get out of the line of fire. It was, lawmakers said, a classic example of good people with guns stopping a bad man with a gun. “We were sitting ducks. We had nothing to fight back with but bats, if it came to that,” Mr. Williams told reporters. He said there could have been as many as 25 deaths had the armed officers not been present.